A while ago I saw this amazing card by Maile Belles and knew I had to re-create it somehow. 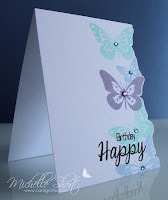 So I have used the beautiufl butterflies from the Cleary Besotted Stamps Butterfly Wishes set and stamped them along the side of a card base. I then cut the side with scissors following the line of the butterfly wings. 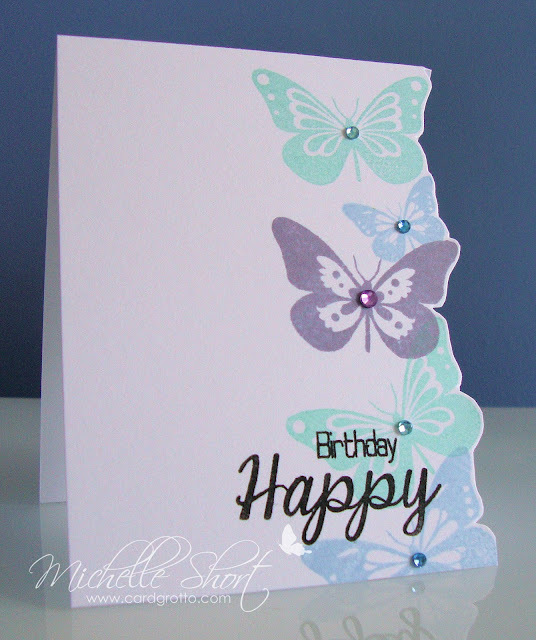 The stamped greeting is part from the Butterfly Wishes set (the happy) and part from the Happy Everything set (the birthday). Jewels added to finish. 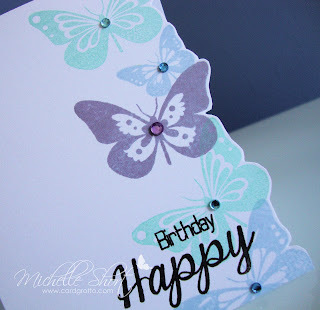 I am entering this card in to this week's Less Is More challenge of wings (haven't played along on a while and couldn't resist using butterflies for wings even if it is predictable!). Thanks so much for visiting today, sorry for the rubbish photo's. 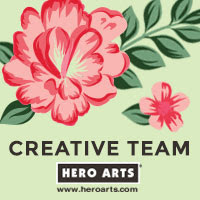 I am having really bad problems with the lighting in my craft room at the moment due to the darker days. Anyway, hope you have a lovely Sunday. I have re-drawn my giveaway so please check below if you are a new winner. Thanks! Wow, this really caught my eye in my Google Reader! Sooo BEAUTIFUL! Oh mIchelle, I hadn't seen your card when I posted mine to LIM - great minds think alike! Except that yours is MASSES better than mine!!! Gorgeous card Michelle, the Butterflies are lovely and the colours you have used are very pretty. 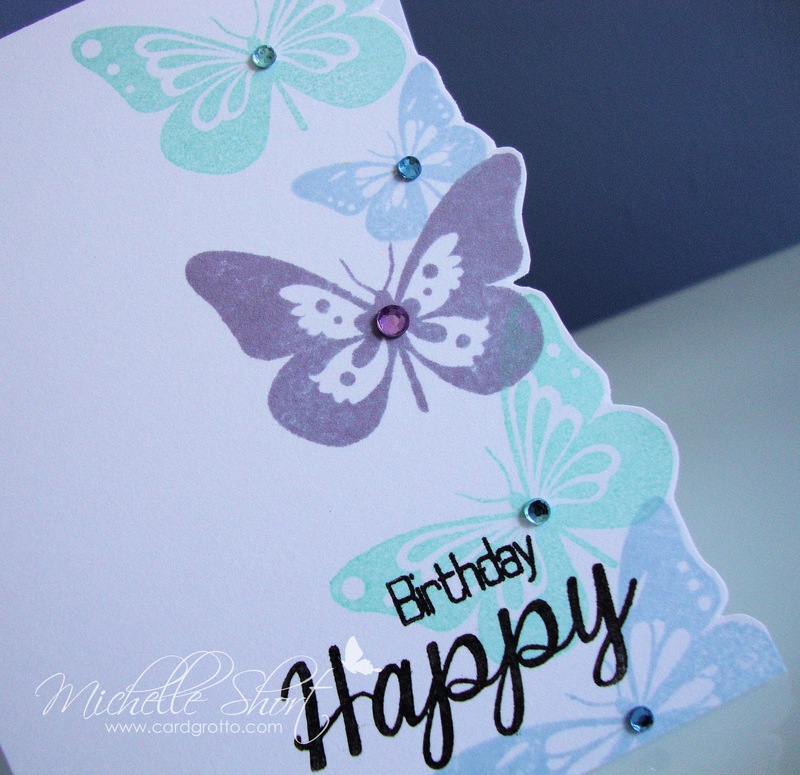 I like the way you have cut around the edge of the Butterflies, very effective. Michelle, this is so beautiful. I really love how you've cut around the edge of the butterflies. WOW!!! This is stunning Michelle. I really love the design and gorgeous colours too. Hola Michelle, beautiful card and great idea cut the edge follow the butterflies, gorgeous colours, well done. 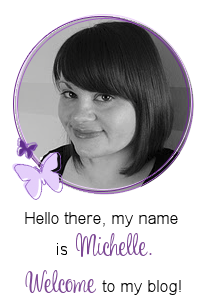 This is gorgeous Michelle and it's great to see you here again! My mum loves loves loves butterflies!! This would be the perfect card for her next birthday!! I wonder if I've got any butterfly stamps somewhere??? Mmmmm I might borrow this wee idea too! Lol! Thanks for the inspiration!